Forget having to hold your tablet; the Tablift holds it for you and does so on four flexible legs with varied angles. We think a lot of people will be wondering if this is the product to solve stiff arm and neck problems related to extensive tablet usage? 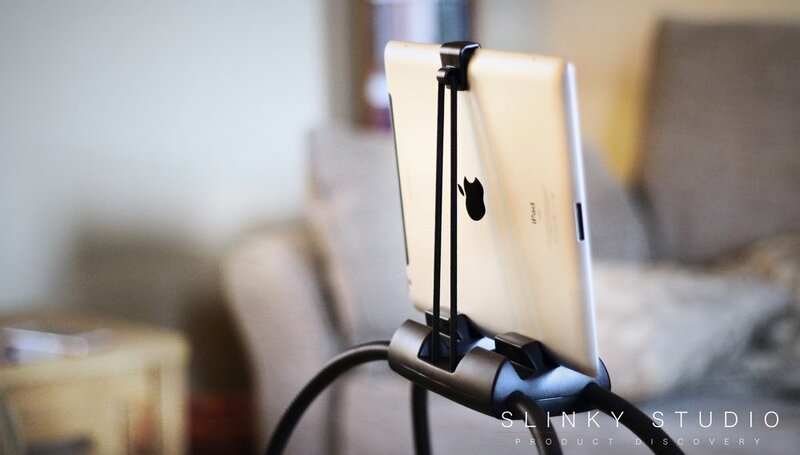 The beauty of the Tablift Universal Tablet Stand is that you can insert almost any tablet into it thanks to an elasticated chorded mechanism keeping the device securely locked into one of the 3 angled 10mm slots for varied viewing options based on how you’re sitting. We’ve been using the full size 9.7” iPad over a few weeks and can safely say it’s not an annoying chore to pop it in and out - although only a very thin case can accompany the tablet. The fact the legs are flexible and can be shaped to your liking depending on your sitting/lying arrangement also means the legs can be folded for the Tablift Universal Tablet Stand to be stored within a drawer or popped into a backpack. Incidentally, this isn't a cheaply constructed stand, the legs are weighty and take some effort to shape - so they definitely can’t be accidentally manipulated. 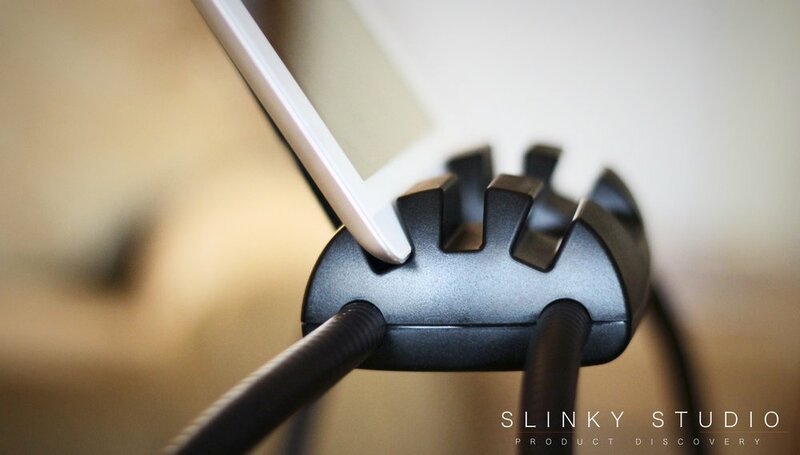 Furthermore the rubber feet add genuine grip when in use, particularly given the weight of the stand, and even the plastic part on top where the tablet sits is fabricated from a dense material. Right away you’ll notice that due to the fact that almost any tablet can be used with this stand, they can be fixed into position in either landscape or portrait view. Watching video content is a particular favourite function - the image is so stable! And general browsing of the internet or App dipping is ideally suited to such an upright experience. What we found was not so favourable is the art of lengthy typing when rested with the stand over you. It usually means your arms are directly pointed upwards for long periods, so they become tired from such a workout where no resting position exists. Typing is a vertical activity! When reclined, say in bed or on the sofa, the stand makes the activity of using larger tablets like our iPad less fidgety because we can comfortably use both hands to interact with the screen and just generally relax. This is brilliant, but the sizeable benefit is actually gained from neck and back relief. A noticeable disappearance of aches after using the stand for periods as long as 2 hours meant we were definitely doing it wrong previously; so hopefully this stand will go some way to helping long term back issues with some team members here. The solidly made Tablift tablet stand adds comfort to using a tablet whilst reclined and sitting down regularly. In fact, you could even take it to work with you to use as a practical desk stand. Of furthergreat importance is the fact it helps to relieve neck and back pains associated with holding a tablet, instead keeping our heads rested and not having to stare downwards for too long.